Three syllables to strike fear into the heart of all but the most accomplished (or uninformed) cyclist. The most iconic, the most mythical, without a doubt the most famous climb in the Pyrenees and arguably in the world. When cyclists meet to talk about the hardest climbs, the Tourmalet is never far from the top of the list, directly compared with the Galibier, the Mont Ventoux, the Stelvio and […insert your favourite climb]. The old stories of Alphones Steinès’ telegram to Henri Desgrange, Eugène Christophe’s broken forks and Octave Lapize’s cry of “vous êtes des assassins” have been told and retold so many times they don’t bear repeating here. But they are only the best known amongst a library-full of stories, each story embellished from year to year even as new ones are written. Let’s get the statistics out of the way first. No matter which side you start from, the col du Tourmalet is a long way up. From the west the climb starts in Luz Saint Sauveur and reaches the summit 1404m higher after 19km of climbing at an average gradient of 7.4%. As is often the case the average figure is misleading, because the road includes pitches that are almost flat and others at more than 13%. The engineers that constructed the road obviously enjoyed a joke, because the steepest part comes at the end. From the east, the climb starts in Sainte Marie de Campan. The climb is a little shorter from this side, rising 1268m over 17km, also at an average gradient of 7.4% and with sections at more than 13%. Sounds a little easier from the east, right? The statistics only tell part of the story however. For any decent climber it is not the mountain itself that causes trouble, it is the accumulated fatigue, the weather conditions on the day and above all what happens in the race itself that makes a difference. The pace you ride at dictates how hard the climb is on any one particular day, and if your principal rivals decide to attack, you have no choice but to go with them. Conversely, if the peloton decides to take it easy, the climbers will barely break a sweat (unlike their sprinter colleagues, who are forced to make much bigger efforts just to avoid the time-limit). Eddy Merckx certainly knew how to attack. In his prime few could hold his wheel for long. In the 1969 Tour de France, Merckx was responsible for one of the greatest rides in the history of the Tour when he soloed for 140km over the Peyresourde, Aspin, Tourmalet and Aubisque (the famous “Circle of Death”), to win by nearly 8 minutes. Although this was a feat already achieved by Ottavio Bottecchia, who won by almost 19 minutes over the same four cols (but in reverse order), L’Equipe hailed him as ‘greater than the Tour, greater than men’, defining that day as the ‘birth of Merkxism’. Another rider to break through on the Tourmalet was Miguel Indurain. Greg Lemond was favourite to win his third straight tour, until Indurain powered away from him in the last kilometre of the Tourmalet. In 200 metres Indurain gained 17 seconds on Lemond and the face of the race changed. These professional considerations are far from the concerns of the average sportive rider. Consider the Etape du Tour, which has taken the amateurs over the col du Tourmalet no less than four times in the last seven years. The 2010 edition saw a summit finish on the Tourmalet after the col de Marie-Blanque and the col du Soulor. In 2012 the Tourmalet came between the Aubisque and the Aspin and Peyresourde, and the 2014 Etape du Tour was a repeat of the 2008 version with the col du Tourmalet to be climbed before the summit finish in Hautacam. Anyone lucky (or masochistic enough) to have ridden all four of these sportives is likely to have a very different memory from each. You don’t climb the Tourmalet the same way if it is a summit finish as if it is the second climb of four in the “Circle of Death”. Also, it should not escape your attention that the northern part of the Pyrenees where the Tourmalet is situated is rather close to the Bay of Biscay, famous for its stormy weather. The col is more often shrouded in cloud and wet with rain than resplendent under bright sunshine, as the hapless riders found out in 2008, 2010 and again in 2014! Cursed, the Tourmalet, or just well named? Neither, is the answer, just a victim of its geographic situation. 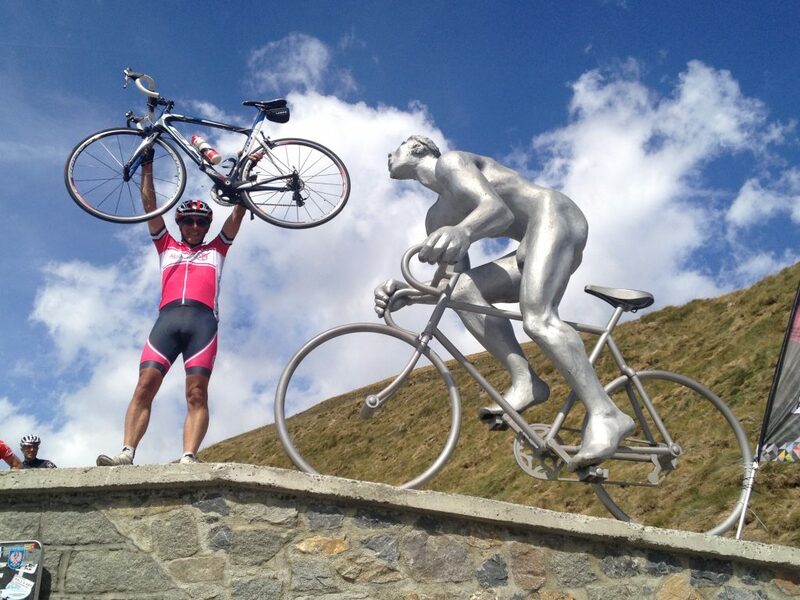 Tourmalet does not translate as a ‘bad trip’, like many think, because the name actually comes from the Gascon language and is perhaps best translated as the ‘far-off mountain’. The far-off mountain is exactly how it seemed to the Haute Route riders when they lined up at the start ramp in Luz Saint Sauveur on Friday September 5th 2014. After 500km and 12,000m of climbing over the previous four days, they were to ride a time trial to the summit of the Tourmalet, no less. The ride up from Argelès-Gazost gave plenty of time to reflect on the challenge ahead: 1400m to climb in just under 19km, against the clock. The ultimate test of will, mind over matter, the challenge made even more cruel by the reverse order of start meaning the slower riders would frequently be overtaken. Imagine you were there. The morning is overcast and the air feels damp and cool. You enter the waiting area at the appointed time. There is some nervous banter but most people aren’t talking much. Time seems to stand still. You check your bike, again. You take quick sips from your water bottle. Your pulse seems unnaturally high. There is a hollow feeling in your stomach. At last your turn arrives and you climb the steel steps to the ramp, awkward in your cleats. You swing your leg over your bike, clip in and wait, your bike held for you during the final countdown. 3 – 2 – 1 – Go! You are off! With a burst of adrenalin you roll down the ramp, pedal swiftly out of the starting area and turn left on to the main road. The slope rises immediately, if only gently for the first few hundred metres, still in the village. As you leave Luz Saint Sauveur you pass the 18km sign. It is marked 8%. The road stretches out far ahead, rising relentlessly. This is going to be long. You try to settle into a rhythm, turning the pedals as smoothly as possible, trying to settle your heart down to a sustainable beat. The gradient changes imperceptibly, sometimes a little steeper, sometimes a little easier, making the rhythm hard to find. After about 4 kilometres the monotony is broken by the first of two sets of short hairpin bends. Riding hard, you are starting to hurt and barely glance back at the magnificent view down the valley. You pass a couple of slower riders labouring hard. This provides a great boost to your morale and the pain disappears for a while, until you are overtaken in turn… Soon after the second set of hairpins you reach the village of Barèges, quiet this Friday morning. The inhabitants have had over a century to get used to cyclists riding through their village and don’t give you a second glance. The first of two feed stations is here. No need to stop, you grab a paper cup of water as you pass, drink half of it and throw the cup at the bin. Soon after Barèges you have an unwelcome surprise as the road steepens to over 13% for a few hundred metres. You stand up on the pedals and pass three more riders. Nothing is said. It remains steep for the next kilometre before levelling off to an easy section near the ski station car park. You can now see the head of the valley and can imagine where the col must be, impossibly higher up what looks like a sheer rock face. The road leads on straight towards it. 8 km left to climb, with nothing less than 7.5%. The sun is starting to break through and you are sweating more and more heavily. The road makes a big loop around to the right, climbing steeply again. You pass the Super-Barèges ski station. The lactate accumulated in your legs makes its presence felt. You stand more and more often on the pedals, but never for long as new sources of pain appear. The gradient approaches 10%. There are still 4 km left to climb. You do mental arithmetic, trying to work out how much longer you have to endure at your current average speed. The numbers are awkward and the answer maddeningly elusive. Is it closer to 15 minutes or closer to 20? Surely not more? 13 minutes? 17 minutes? You give up the mental effort and concentrate on turning the pedals. You look again for another gear, but your chain has been as far to the left as it will go for the last 5 km. Why didn’t I change the cassette? You ask yourself, not for the first time. You are riding with a 34-27, but you know that many riders are using a 28 or even a 32 tooth sprocket. Too late now. Damn, there are still 3km to go. Another long straight, this one cut into the rock face, before the road curves around to the left and winds up slowly towards a right hand hairpin. The valley is now laid out below and you can see a long line of riders behind you inching their way painfully towards the col. Somebody overtakes you. It is hot. The road is steep and never ending. You can’t remember whether the last marker said 3km to go or 2km and pray it was the latter. Early finishers are flashing down the road as you grind on up. The bare rock is steep. You can’t see the summit any more. The road disappears around a left hand bend. You count the pedal strokes. When you finally reach the bend, you can see the last hairpin in front. Glancing up to your left the summit seems to hang vertically above you. The final kilometre passes in a daze, every turn of the cranks a huge effort as the altitude and accumulated fatigue takes its toll. For the record, the stage was won by US rider Tristan Cowie in an impressive 59’12”, and the lantern rouge was the Australian Stan Galagher who made it to the top after an incredible 2 hours and 43 minutes of effort.